Redmond Market Trends: Updated every month, here you'll find historical and timely data about the Redmond real estate market. 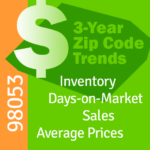 Three charts illustrate the local trends for two ZIP codes. Three-Year Inventory and Sales, Average Days On Market, and Average Sold Price, each charting the trends for both Redmond Zip codes. The charts show data for single family homes. For information on ZIP codes not covered here, see SERENE which shows the trends for more than 40 Zip codes in and around Seattle and the Eastside. Redmond Home Sales 98053 | Inventory is the number of active (“For Sale”) properties. When the number of active properties is higher than the number of closed sales buyers have the upper hand. When there is more supply than demand, prices tend to fall. Redmond Home Sales 98052 | Inventory is the number of active (“For Sale”) properties. When the number of active properties is higher than the number of closed sales buyers have the upper hand. When there is more supply than demand, prices tend to fall.